Motlow State Community College will host an Autism Awareness Walk at all four Motlow campuses on Monday, Apr. 2, from 2 – 4 p.m. The event is sponsored by the Motlow Student Government Association and organized by the Motlow Autism Awareness Committee. 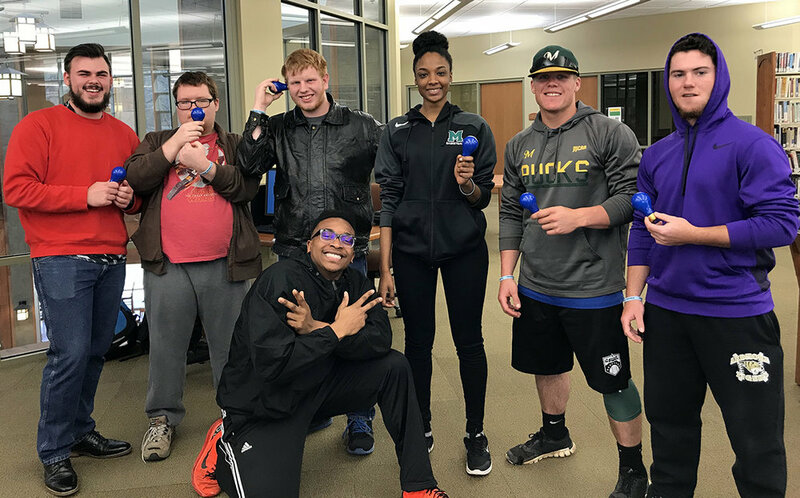 Blue light bulbs, shown being held above by Motow students, standing from left to right, Trevor Ivey-Bodman, Roger Steele, Frank Crabtree, Racquel Robinson, Kirby Smith and Patrick Music; and kneeling Joelah Solomon, will be given to participants (while supplies last) to be used during the month of April to bring about awareness of autism. All Motlow State Community College campuses will host an Autism Awareness Walk on World Autism Day, Monday, Apr. 2, from 2 – 4 p.m. The walk is funded in part by the Motlow Student Government Association (SGA), and will be held simultaneously at all four Motlow campuses: Moore County, beginning at the Forrester Student Center; Fayetteville, beginning at the Sundquist Room; McMinnville, beginning at the Main Lobby; and Smyrna, beginning at the MaryLou Apple Lobby. The event will host speakers on each campus, followed by a campus walk and culminating with cake served by the SGA. The Motlow Autism Awareness Committee helped organize the walk, and consists of faculty and staff from each campus that are knowledgeable and passionate about promoting continued learning and awareness concerning Autism Spectrum Disorder. 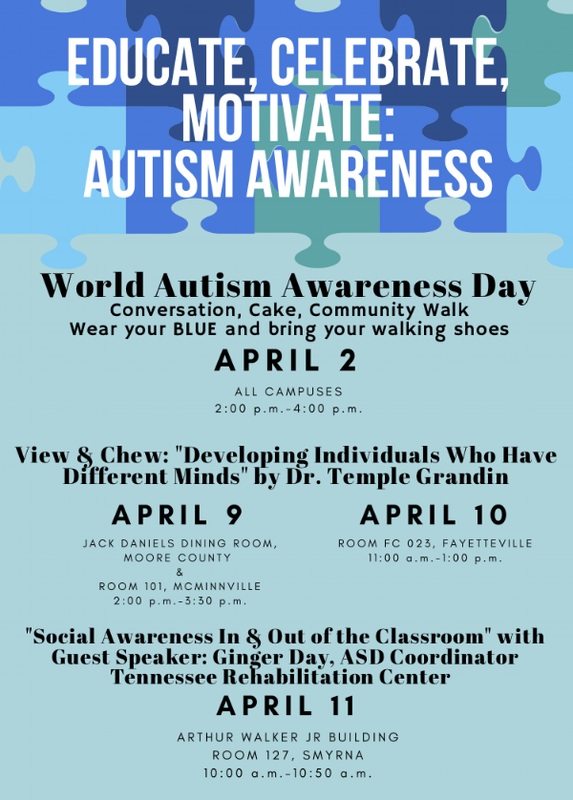 Motlow students, faculty, staff and the public are invited to participate, and are asked to wear light blue, the official color that represents autism. Blue light bulbs will be given to participants (while supplies last) to use in porch lights and table lamps during the month of April to help spread awareness. In the event of rain the walk will be canceled, but the event will continue. For more information contact Angelica Dotson at adotson@mscc.edu or 931-393-1601.